Flavor Text: Collecting and documenting the specimens was of the utmost importance. I don't think it can be overstated just how good this guy is. His cost/icon/skill block is nice especially considering he offers an arcane icon, relatively scarce in Shub. And his ability is like a miniature Feeding Time, except you're getting a body attached to it. He's giving you tempo AND card advantage all in one. And if you're running Favor of Eshu, he's also giving you recursion. I imagine this guy is happiest in a dedicated Mi-Go deck, but here's one case where I don't care about the Subtype. He's great in any build with any faction combination. 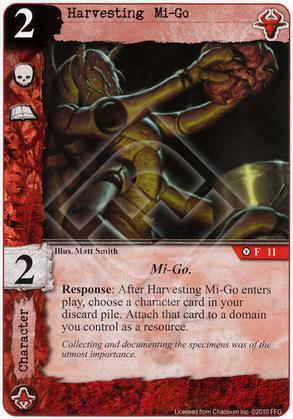 Guys like Harvesting Mi-Go are what the game's all about to me. Sleek, elegant, efficient design with utility to boot. Love him. Yep, and if you are running Book of Iod or characters like Arthur Todd, then you can reliably have a character in your discard pile early enough to benefit nicely from his effect. Indeed. I'm pairing him up with Arthur Todd and The Festival, so very similar to your idea.